Parker Gallant and I recently wrote on the previous cold snap and noted that the market price in Ontario is sometimes set by exports. Today I'll show some indicators of the day's pricing in the markets likely to impact pricing in Ontario. Some quick background: the Ontario price I usually show is the Hourly Ontario Energy Price (HOEP), which is really an average of a market control price that is set every 5 minutes. The U.S. screen captures (and links) below are locational marginal prices (LMP), which I believe are also 5 minute prices set by zone/location. However, I believe Ontario only has hourly schedules of imports and exports, so the hourly change in exports can/should reflect what is about to happen to LMP's in the export markets. As of hour 17 (5pm) the highest hourly price in Ontario was in hour 11 ($221.83), and that was the hour of greatest export through the Michigan interties. In the case of MISO, the price didn't head as high as may have been expected, although at 11:30 it did rise above $200/MWh in the zones adjacent to south-western Ontario. MISO extends all the way to the Gulf of Mexico and today's peak will be about 5 times the size of Ontario's. They also have, in my view, the niftiest graphical information system (GIS)for displaying, and playing through the day's, pricing. It used to stand for Pennsylvania, Jersey and Maryland, but now it includes jurisdictions far beyond those 3 states. PJM is, I think, slightly larger than MISO (MISO has grown recently and I could be wrong). The screen capture is from around 6 pm - moving into the evening peak, with prices soaring. However, Ontario has no direct interconnection to PJM. There is a private proposal to construct one from around Nanticoke on Erie's north shore, across/under the lake, coming out near Cleveland. 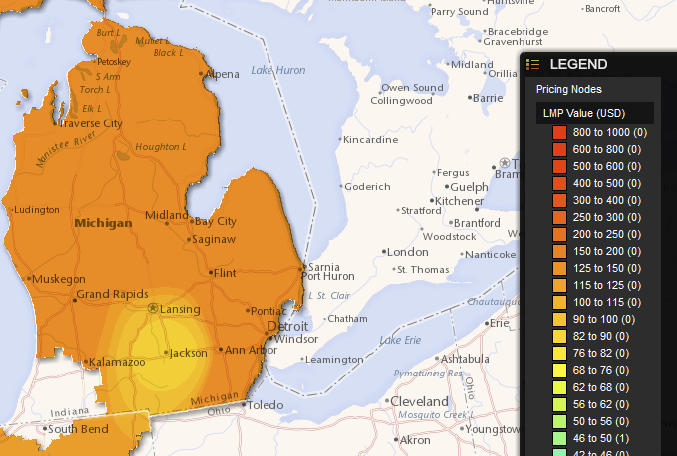 For now the pricing impact in Ontario is probably via Michigan and New York (Niagara area) interties. 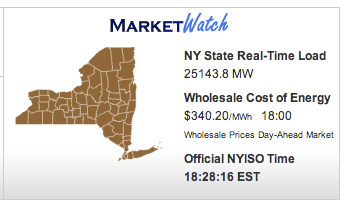 Similar to Ontario in terms of market size, it includes only New York ... and it doesn't have, as far as I can tell, any cool GIS displays for locational market pricing. On the other hand, they are taking over 1000MW as I write this, and the HOEP is now (~6:30pm) at a new high for the day. The New England system is probably smaller than New York's, but likely the most newsworthy this season. Ontario has not direct interconnection to the New England ISO territory, but Ontario is usually exporting to Quebec (it certainly is today), and that is usually not because Quebec requires imports to meet its internal demand; Quebec is usually exporting into this market (as is New Brunswick). The New England ISO has seen big growth in generation from natural gas-fired generators, but the gas infrastructure has not grown with it, causing a competition between heating and generating electricity during cold winter periods. 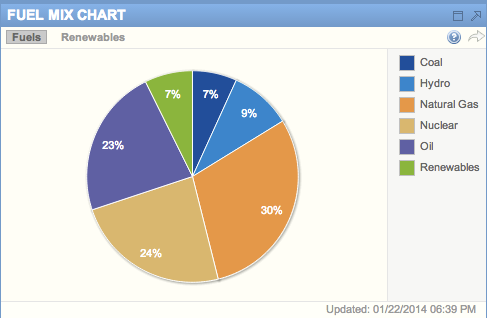 Interesting, to an Ontarian, is that even during the coldest periods coal-fired capacity has been so reduced that it provides only 7% of all generation; the same as "renewables", although in New England the "renewables" are primarily biomass/wood, and garbage. Essentially all coal-fired generators want to close as they are no longer economical, although the New England ISO is indicating it requires some to stay operational beyond the requested end dates (here). Ontario's coal-fired generators were kept operating by a "contingent support agreement" that became effective January 1, 2009 (I believe the contract runs through 2014 - some details page 7 of OEFC 2008-09 Annual Report).